Poverty benefits only the enemies of democracy to keep the masses of our people in a perpetual cycle of poverty, while those who govern them remain at the top of pyramids built with stolen public goods. Politicians seem to spend most of their lives suckling happily at the overflowing teat of misery. Every time politicians tries to talk about extreme poverty but they seem to regurgitate a fur ball of crap. They never want to curb poverty. Poverty is considered as fertile land for the Indian politics to grow and flourish and the poor an asset, vote bank and fertiliser for its growth. The victory or defeat of any political party depends upon the fact how best it can manage maximum votes from among the poorest of the poor because it is very easy to exploit the poverty for gaining the political mileage in India. While poverty is considered curse on the human race, they are taken as blessings for the Indian politicians because poverty is highly politicised in India. It is a reality that Indian ruling class, irrespective of party in rule, not only love poor but wants them to remain poor for their votes and the money to be made from exploiting them. No political party can ever win the election without the support of the poor. Poor, in India, have become a laughing stock, a class to jeer at by the politicians. The politicians need the services of the poor people for getting crowds during the rallies and public meetings. They manage votes from the poor ilk by alluring them with money, ration, alcohol, freebies and other necessities. The politicians understand that the poor man is like specie worth preserving, a lactating cow who always stand by the politicians through thick and thin. It is fact that the ruling class pose loving the poor but wants them to remain poor forever. A pledge to eliminate poverty has figured prominently in the election campaigns of all of India’s political parties since the country gained independence in 1947. Exploitation of the vulnerable section of the society is almost a norm for the majority of political players and that leads to unwanted resisted in reforms. 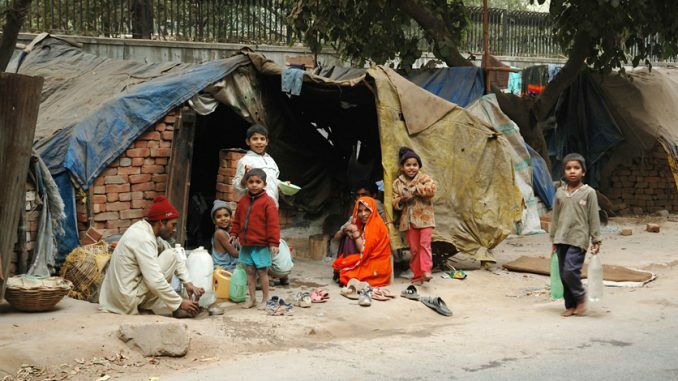 In India, poverty is a political industry for leaders as well as political parties. Forty six years ago a prime minister, Mrs Indira Gandhi gave a slogan garibi hatao (eliminate poverty); even today, her grandson, Rahul Gandhi showing love towards poor proclaims that the Congress Party is for the poor. In India, most poor people vote for their livelihood; about 6,000 people require these votes for their livelihood. The richest pay nothing to run the country; agricultural farmers and corporate farmers are there to do this job. All poverty-alleviating schemes are perpetual. One tough way to reduce poverty is by reducing the number of poor people-ensuring that the poor do not bring any more poor into the world. But with some political leaders urging people to have more children, which they think guarantees more votes from a caste or religion, and industrialists, who need a large number of unemployed people to pay little, subsidies have fed not only the hunger in the stomachs but also something else.